Working on an annual franchise is never easy. If it is a sporting game then things can be complicated to the unlikely. At the end of every edition, it is up to the developers' heads to accuse of publishing an update of the teams without any particular news, which forces the designers to invent something that could justify spending from year to year: sometimes they succeed, others less, spacing for their finds from new elements in gaming dynamics to the available modes. The new Madden NFL 18 does all that, bringing elements of more than just a single look while fiddling with FIFA 17. The new chapter of the nearly thirty-year American football simulation follows the footsteps of that football, approaching it to more than one reason. Are you curious to know how and why? You just have to keep reading! Like FIFA 17 with its Journey, Madden NFL 18 brings with it a story mode, introduced by developers to tell the story of a promise of football. The person in question is Devin Wade, a young sporting phenomenon out of the field for three long years before attempting luck together with his inseparable friend and teammate Colt Cruise participating in the Scouting Combine that is held each year in Indianapolis. After the brief introduction dedicated to the childhood of the two, Longshot (this is the mode name) takes us right in front of the eyes of the NFL team observers, focusing on some aspects of the friendship between Devin and Colt that will naturally continue to be a background to all 'entire plot. Just like Alex Hunter's story in FIFA 17, Longshot is an appointment scheduled to last in the coming years, bringing in the Devin Wade story from time to time, taking advantage of it to introduce the game to newcomers. 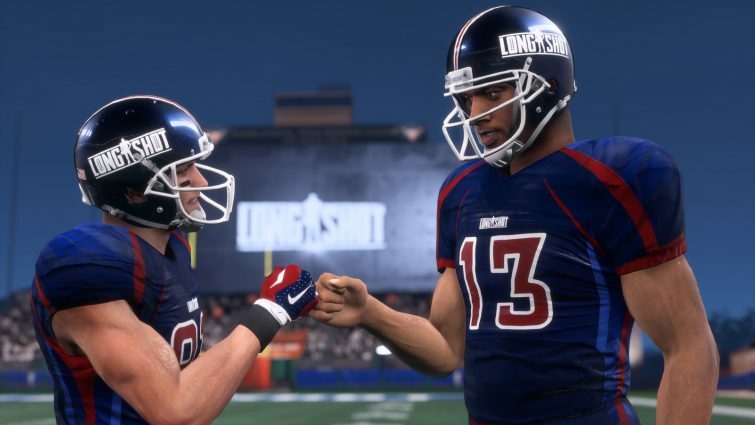 American football is so fascinating and complicated, at least in the eyes of most of us Europeans, why not use Longshot as a Madden NFL 18 entry point should not look so weird. At times, Devin is sometimes subjected to real tactical lessons, which the player can take advantage of to increase his knowledge of this sport. In fact, much of what happens in Longshot has little to do with field action, relegating the latter only to a few moments. From the point of view of the Longshot narrative, it goes far beyond the FIFA 17 Journey, approaching the amount of dialogue and the presence of multiple (and difficult) choices to Telltale Games's gaming style. Everything is guided by the hands of the Madden NFL 18 developers, of course, but put together in a way that allows you to enjoy the handful of shots that serve to complete Longshot before you can devote yourself to the game "real". 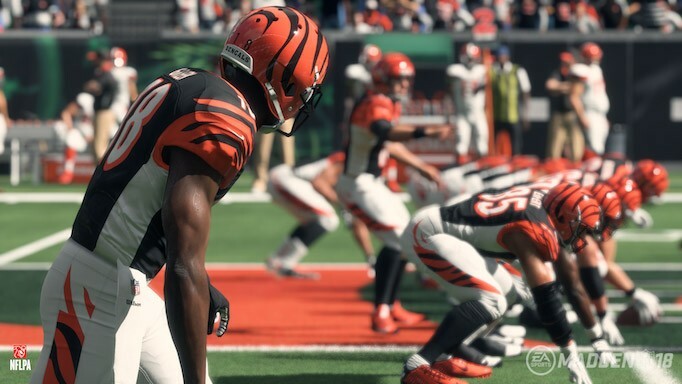 By the way, like FIFA 17, Madden NFL 18 says goodbye to the old Ignite Engine, opening the doors to the Frostbite: in a way like Longshot coming, it could not have been otherwise. Succeeding inside Madden NFL 18 requires a great deal of effort, especially if you approach this series for the first time. Continuing on their way to the benefit of newcomers, the EA Sports guys have introduced game styles that affect what is seen in the field. Classic simulation is obviously part of the three alternatives, which complement the arcade and the competitive style. In the arcade, realism gives way to the show, promising games with high scores and playing at the limit of the impossible. Competitive style is linked to online gambling, a midway between the two previously oriented towards simulation. Depending on your taste, you can choose one of these three ways, while common with everyone there is the new pass mode called Target Passing, which can be activated alongside the traditional one using the appropriate key combination after the snap. From the theoretical point of view, Target Passing allows our quarterback - and therefore to us - to have more control over the direction of the ball, offering the ability to sew passes which otherwise would not have been possible with traditional mode use. However, in practice, there is a short-time problem that is available to target and to put the launch upside down. Needless to say, the sack is around the corner. Returning to the available modes, Franchise seasons are more or less alike with the ability to improve their team with parameters gained through field experience, while an interesting novelty also concerns Ultimate Team. If in its basic essence the card collection has remained unchanged, the introduction of MUT Squads is able to capture the interest of those who have never gone crazy for the Ultimate Team. It is a cooperative playable mode of up to three against three online, in which each player takes on a key role as head coach, attack coordinator and defense co-ordinator. Choosing the roles thus divides their responsibilities before going into the field and controlling their players. The formation of the team draws from the roses the participants possess, thus securing a potentially infinite variability. Graphically, the area where the introduction of the Frostbite engine is most noticeable is in the Longshot mode. In this case, the use of technology coupled with the use of true actors makes the characters animate perfectly, alongside the care of places where Devin and Colt move their footsteps to enter the NFL world. Once in the field the differences are noticeably less, but this is not to be interpreted in the negative: Madden NFL, in fact last year, guaranteed a considerable level of performance, improved in 2017, especially with regard to the presentation phase of the match. Starting the game, it is noteworthy that collision management is more efficient, although there are no cases in which players make things strange on the pitch: in a year of transition from Ignite to Frostbite like this, they are definitely pardonable. Confirmed Brandon Gaudin and Charles Davis on the teletext, which will need to work again to deal with some inaccuracies over what is happening in the field. Normal level soundtrack, lower than normal listening in a FIFA. Lastly, we report some loading too, inherited from last edition despite the change of engine. Madden NFL 18 brings up forty-one trophies, one of which is platinum, three gold, twelve silver and twenty-five bronze. Their typology ranges from all the gaming modes, of course the new Longshot to be completed according to particular parameters to receive their reward. Collecting them will keep you busy a lot, considering also the need to win with each of the thirty-two NFL teams to win one of the Gold Trophies. Cheap Madden 18 Coins for sale on PS4/ Xbox One in store now, you guys can click www.madden-store.com for it.